Interstate 12 functions as a bypass route for Interstate 10 north of Lake Pontchartrain and the New Orleans metropolitan area. Although an intrastate route, the freeway provides a significant role in cross-country travel. The freeway splits with Interstate 10 in Baton Rouge as a busy commuter route through suburban areas east to Denham Springs. Continuing east, I-12 becomes more rural through areas of pine forest, but still with moderate traffic given it accommodates just four overall lanes. Interstate 55 crosses paths with Interstate 12 outside Hammond, the largest city between Baton Rouge and Slidell. 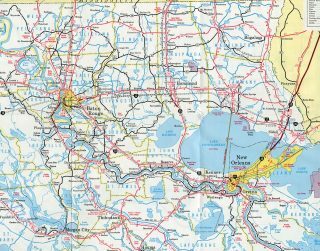 The freeway passes south of the city street grid and quickly exits the area toward Covington and the Lake Pontchartrain North Shore communities of Madisonville and Mandeville. There U.S. 190 ties in from the north end of Lake Pontchartrain Causeway, a lengthy toll bridge leading south to Metairie and Jefferson Parish west of New Orleans. The remainder of Interstate 12 leads east through St. Tammany Parish to Slidell and the junction with Interstate 10 and 59 north. 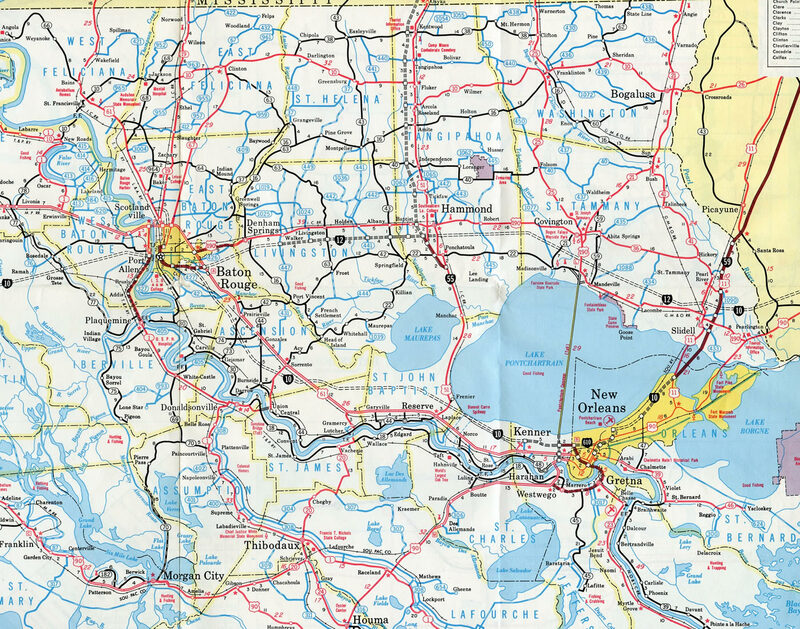 The freeway passes through North Slidell and suburban areas before defaulting onto I-10 east across Pearl River Wildlife Management Area into Mississippi. Interstate 12 replaced U.S. 190 as the through route north of Lake Pontchartrain. U.S. 190 parallels I-12 to the north from Baton Rouge east to Covington and to the south between Mandeville and Slidell. Break out the Baton Rouge North Bypass from I-10 to I-12 (LSTP-051) to Priority A and B: Priority A – new Interstate I-12 from I-10 west of LA 415 to US 190 and bridge rehabilitation to Airline Highway, stop at Plank Road interchange. Move project from Priority B to Priority A ‘mega’ projects. Priority B – Plank Road interchange to I-12, build/upgrade to 4-lane interstate standards”. The CRPC consultant study in 2004 indicated it would cost $910 million to construct the expressway. This included spending $300 million for upgrading the U.S. 190 Mississippi River Bridge, which was built in 1940. Due to the high costs for construction of the bypass, many believed that the road should be deferred in favor of improving existing roads around the Baton Rouge metropolitan area, especially Interstate 12 and main arteries serving Downtown. Furthermore, one of the project’s chief critics, State Representative William Daniel, a Democrat from Baton Rouge, sued the CRPC to get the information about the costs of the corridor prior to the official release date of the study. Coupled with an expected completion date in 2020 and the prospect of tolls, critics were also skeptic about the project’s viability.2 The Northern Baton Rouge Bypass never advanced beyond early studies and discussion. Interstate 12 Houston to Austin: These metropolitan areas have grown rapidly. Less than 100 miles, this route would require upgrading from Austin to Interstate 10 along the state route 71 corridor. SH 71 is a four-lane roadway for its entire length, with portions already upgraded to expressway standard. One upgrade along the SH 71 corridor is the SH 71 Express Project in Austin. Construction between early 2015 and late 2016 upgraded 3.9-miles of the highway, from Presidential Boulevard at AUS Airport to SH 130 near Onion Creek, to a limited access toll road. Work added two toll lane overpasses at FM 973 and SH 130. 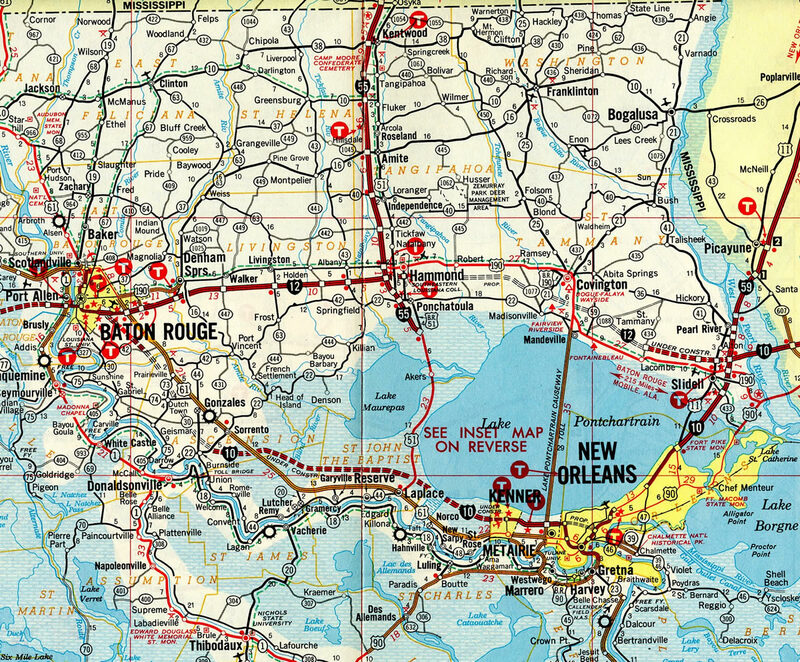 The 1963 Louisiana Official Highway Map shows the westernmost two miles of I-12 as complete. This was shown correctly as under construction on the Baton Rouge inset. Work was also underway after 1963 on I-12 from LA 447 and the Ponchatoula Bypass, the first portion of I-55 opened to traffic in Louisiana. Interstate 12 was open from Baton Rouge east to U.S. 51 Business at Hammond by 1972. Construction along I-12 continued in 1972 on the easternmost segment from LA 434 to I-10 and 59. Older signs displayed at Exit 1A from before expansion of I-12 west to three lanes for I-10 west. Vidcap taken 01/18/96. Interstate 12 was completed between U.S. 61 (Airline Highway) at Baton Rouge and Interstate 55 at Hammond in 1969. The western most two miles of Interstate 12 opened in conjunction with Interstate 10 east from College Drive in 1965.3 Interstate 10 southeast from I-12 would not be completed until 1974, resulting in traffic defaulting from I-10 east onto I-12 and U.S. 61 until 1969. The first of in a series of guide signs for I-10 and I-59 north on Interstate 12 stands beside the U.S. 11 underpass at Exit 83. Photo taken 05/09/15. Construction along Interstate 12 completed in 2012 added a lane in each direction between U.S. 11 and the exchange with I-10 and I-59 (Exit 85). The third eastbound lane defaults onto I-10 southwest to New Orleans. Photo taken 05/09/15. Carrying commtuers from the Northshore into New Orleans, I-10 crosses Lake Pontchartrain south from Slidell into New Orleans East. Photo taken 05/09/15. I-10 west overtakes the freeway leading south from I-59 and Picayune, Mississippi at Exit 85A. Four interchanges line I-10 west through the Northshore city of Slidell. Photo taken 05/09/15. Exit 85B loops onto Interstate 59 north. The freeway crosses the Mississippi state line in 11.5 miles near Nicholson and reaches Hattiesburg in 73 miles. Photo taken 05/09/15. This sign was one of several installed during Spring 2000 at the junction of I-10, I-12 and I-59. It was replaced with a new overhead when I-12 was widened on the north side of Slidell. Photo taken by Eric Stuve (12/17/02). Approaching the LA 1091 overpass, a half mile aheadd of I-10 and I-59 north on Interstate 12 east. LA 1090 and LA 1091 parallel both I-10 and I-59 through Slidell between U.S. 11 and U.S. 190. Photo taken by Eric Stuve (12/17/02). A concrete barrier was constructed within the grassy median of Interstate 12 to accommodate six-laning of Interstate 12 at Exit 85. Photo taken by Eric Stuve (12/17/02). Interstate 12 east concludes at the separation of Exit 85B for Hattiesburg and Exit 85C for the Mississippi Gulf Coast. Photo taken 10/04/01. Interstate 10 spans the West Pearl River two miles ahead of I-12 west and I-59 north. Photo taken 05/09/15. The one mile guide sign for Exit 267 precedes the Louisiana Welcome Center. The Slidell welcome center reopened on June 29, 2009 after two years of reconstruction. The $12 million project replaced a 1978-built facility.5 Photo taken 05/09/15. A third lane opens along Interstate 10 westbound for the continuation to New Orleans. Traffic to the right defaults onto I-12 westbound (Exit 267B) in one half mile. Exit 267A follows after the I-10/12 split for I-59 north. Photo taken 05/09/15. Beyond their seperation, I-10 and I-12 both serve the city of Slidell with succeeding interchanges. Interstate 12 reaches Hammond in 45 miles and I-10 travels 38 miles southwest to Downtown New Orleans. Photo taken 05/09/15. 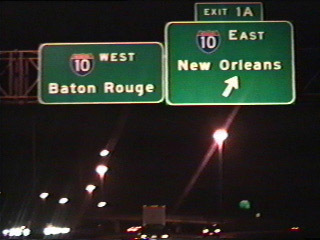 More photos from this perspective, including 2000-based sign replacements, at the Interstate 10 West – Mississippi to New Orleans East highway guide. Guide signs were replaced at Exit 267 in Spring 2000. The overheads preceding the I-10/12 split were replaced again by 2012 with Clearview-font based signs. Photo taken by Adam Froehlig (03/99). The first westbound shield for Interstate 12 appears beyond the Louisiana 1091 (Robert Boulevard) overpass. Photo taken 05/19/14. Approaching the Louisiana welcome center, 1.5 miles ahead of Interstate 12 west and I-10 on I-59 south. Photo taken 05/09/15. Exit 1A leaves I-59 south for Interstate 12 west to Covington at the directional cloverleaf interchange with I-10. Photo taken 04/20/12. Removed sign bridge for I-12 west and I-10 along Interstate 59 south. I-59 south defaults onto Interstate 10 west to New Orleans while ramps connect with I-12 west to Hammond and I-10 east to Bay St. Louis, Mississippi. Photo taken 08/20/01. Resigning of the I-10/12/59 exchange in Spring 2000 removed this overhead assembly for Exit 1B. A bridge mounted sign, replaced as well by 2012, was added at the Brown Switch Road overpass. Photo taken 11/06/99. More photos from this perspective, posted at Interstate 59 South – Louisiana highway guide. A left side ramp (Exit 267B) joins I-10 east with Interstate 12 west. I-59 travels 160 miles northeast and merges with I-20 east at Meridian, Mississippi. Photo taken 04/20/12. Left exit tabs were added to guide signs in 2012 for I-12 west and I-59 north. I-12 converges with U.S. 11 in two miles at Exit 83. I-59 also meets U.S. 11 nearby; the two run concurrent north to Picayune, Mississippi. Photo taken 04/20/12. More photos from this perspective, including 2000-based sign installations, at the Interstate 10 East – New Orleans East to Mississippi highway guide. Entering the half diamond interchange (Exit 1C) with Louisiana 1068 (Drusilla Lane) and 73 (Jefferson Highway), Interstate 12 makes the final approach to Interstate 10. Photo taken 05/19/14. Four lanes of Interstate 12 proceed west from the Essen Lane on-ramp to the three-wye interchange (Exit 1A) with Interstate 10. A lane drop occurs for the eastbound ramp back to New Orleans. Photo taken 05/19/14. The westbound mainline of I-12 defaults onto Interstate 10 west ahead of the commercialized interchange with College Drive. Downtown Baton Rouge lies five miles to the northwest. Photo taken 05/19/14. Interstate 12 west at the off-ramp to LA 1068 (Drusilla Lane), 1.5 miles from the terminus. Most signs for Interstate 12 in Baton Rouge were changed to Clearview font based signs by 2013. Photo taken 01/04/09. This set of signs for Interstate 10 and Exit 1A was carbon copied by 2013. There are no end Interstate 12 assemblies posted otherwise. Photo taken 01/04/09. A sweeping flyover ramp (Exit 1A) carries motorists back southeast onto Interstate 10 as the mainline advances onto I-10 west with three lanes. Photo taken 01/04/09. Interstate 10 advances east from the parclo interchange (Exit 158) with College Drive 1.5 miles to split with Interstate 12 at Exit 159. Photo taken 05/19/14. A fourth eastbound lane emerges from the College Drive on-ramp as Exit 159 prepares to depart with three lanes for Interstate 12 east to east Baton Rouge, Denham Springs and Hammond. Photo taken 05/19/14. Interstate 12 progresses east from Baton Rouge as a busy commuter route to Walker and the default through route for points east along the Gulf Coast. Interstate 10 remains busy with commuter traffic through to Gonzalez. Photo taken 05/19/14. Interstate 12 east separates from Interstate 10 east. Hammond lies 40 miles to the east via I-12 while I-10 east reaches LaPlace in 47 miles and New Orleans in 71 miles. Photo taken 05/19/14. The first eastbound Interstate 12 reassurance shield appears immediately east of the Exit 159 gore point from I-10 east. Drivers reach a half diamond interchange (Exit 1B) with LA 3064 (Essen Lane) in one mile. Photo taken 05/19/14. Interstate 10 east at Exit 158 for College Drive, which is named for Baton Rouge Community College. The split with Interstate 12 eastbound lies 1.50 miles ahead. Photo taken by Eric Stuve (12/17/02). Diagrammatic sign formerly posted along Interstate 10 east for the impending split with Interstate 12. Sound walls were erected along this stretch in 2002. All signs for I-12 along eastbound were replaced by 2013. Photo taken by Eric Stuve (12/17/02). A sign replacement project underway during the spring 2000 coincided with expansion of Exit 159 to three lanes. Photo taken by Jeff Royston (05/27/00). 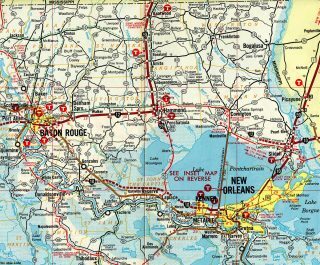 Interstate 12 begins as Interstate 10 turned southeastward toward Gonzales, La Place and New Orleans. Suburban expansion of Baton Rouge spread eastward along the Interstate 12 corridor through to Exit 10 / Louisiana 3002 at Denham Springs. Photo taken by Eric Stuve (12/17/02). Interstate 10 sees a lane drop for Interstate 12 east (Exit 159) beyond the diamond interchange (Exit 160) with Louisiana 3064 (Essen Lane). Photo taken 05/19/14. Interstate 10 bisects a wooded area proceeding the three-wye interchange (Exit 159) with Interstate 12 east. I-10 through traffic reduces to two lanes in each direction through the exchange. Photo taken 05/19/14. Interstate 12 east serves a bevy of commuter traffic through the Southmoor, Cedarcrest and Sherwood neighborhoods areas of the city through to Denham Springs. Photo taken 05/19/14. Exit 159 leaves Interstate 10 west for Interstate 12 east to Hammond and the Northshore of Lake Pontchartrain. Photo taken 05/19/14. I-10 west at LA 3064 (Exit 160) before expansion of both the freeway to six lanes and off-ramp to two lanes. LA 3064 comprises a 1.86-mile long route connecting LA 73 and 427. Photo taken by Chris Patriarca (04/13/03). This sign bridge was removed in 2011 when I-10 was expanded to incorporate a concrete barrier median. Photo taken by Chris Patriarca (04/13/03). Interstate 10 west at Interstate 12 was upgraded to urban design standards here in 2011. Photo taken by Chris Patriarca (04/13/03). “Bypass report shows $910 million, 6-phase plan.” Baton Rouge Advocate (LA), October 26, 2004. “Booklet for I-10 Dedication Ceremony.” Baton Rouge Digital Archive, September 18, 1964. “Signs on I-12 remind people of Florida Parishes republic.” Fox 8 Live WVUE-TV New Orleans, November 24, 2003. “I-10 welcome center reopens near Slidell.” The Times-Picayune, June 29, 2009. Page updated February 10, 2019.